We bred our ewes to Baw Blue (or Blue as he’s commonly called) last year. Reese, our matriarch, “threw” Penny this past Spring. Penny was born jet-black except for a little patch of white on her nose, crown, and very faint white “tears” (which I didn’t even notice until it came time to note her markings). 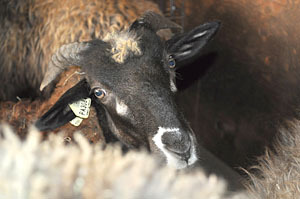 As Penny’s coat grew over the summer, she exhibited signs of black and brown in her wool. The color of churro wool will do that. It can change with age and bleach out with exposure to sunlight. Yet, when the shearer came last week??? What a lovely surprise! As her outer coat fell to the floor, her inner coat was a shimmering light gray-blue against her black legs and under-belly…matched with her distinct “tears” means she’s BLUE. English Blue to be precise. Blue is the genetic color designation (which does not change) and will be noted on her registry paperwork. 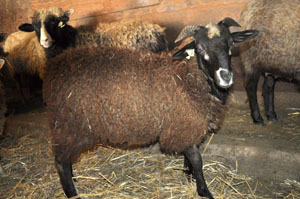 Her wool color will change with age and will also be noted on the paperwork — which will accompany a fleece sample from her shearing at one year of age. 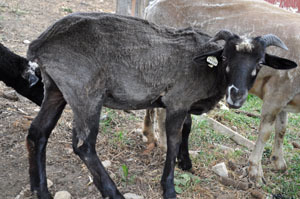 Blue – Born black but in first year develop silver/charcoal inner coat while outer remains brownish/black. 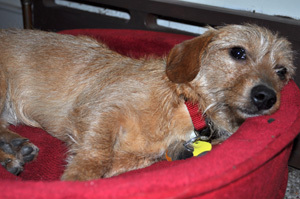 May develop white on eyes and muzzle but keep dark points, legs, body and belly are dark. Hips, sides are greyed. English Blue – Must have white tears, may have white in ears or on muzzle. This is a pattern on Black or Brown. 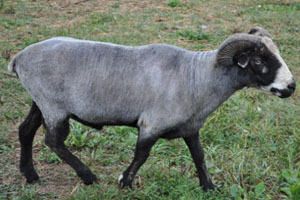 Texel Blue – Resembles Badgerface. There is a dark bar over each eye, dark top of nose, dark under jaw on light face. Why is this so special? It’s special because of the rarity of this particular color. The table shows, historically, less than one percent of the population of registered Churro possess this genetic color. 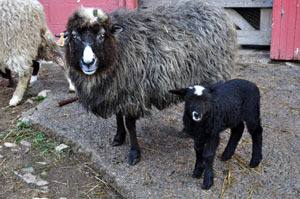 I’m so thrilled to have this color combination in our flock—and to know it’s the matriarch’s ewe-lamb that has it. I can’t wait until Penny’s of “breed-able” age to see how her very special traits are passed on!